*Edit* I have found enough people for the swap. Thank you so much for your interest! Last week I received a quilt tree letter, like a chain letter, where you send fabric squares. I'm looking for 2 more people to send squares to. 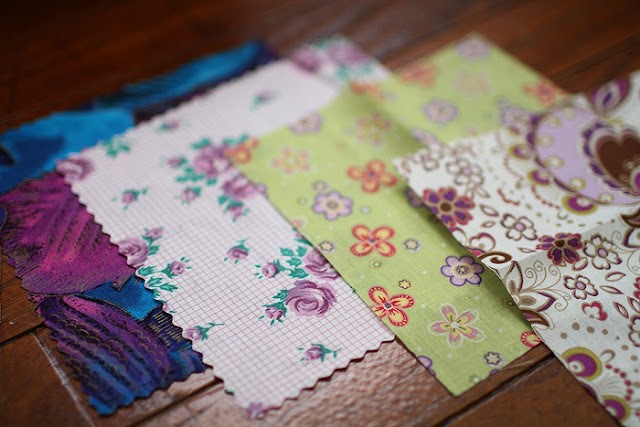 Any fabric hoarders, quilters, or people who love mail and fabric out there want to join me? I'd love to make some new connections too! What's involved is mailing 2 fabric squares with purple in it to the 3 people on the list in the letter and then to 4 of your friends along with the letter. You will then be receiving many squares in return. Considering people follow through, of course! If you're interested please use the contact form to send me your address and you'll have some mail coming your way!